Dogs have long been deemed “man’s best friend.” They can be a family’s pride and joy, but there are times when man’s best friend can become man’s greatest enemy. Nearly five million Americans suffer dog bites every year, and, on average, one out of every six of these dog bites is severe enough for the victim to have to seek medical attention for the injury. When someone is bitten by a dog, the owner of the dog that inflicted the injury can potentially face liability. Generally speaking, in Maryland the owner of a dog can be held liable for an injury that the dog causes to another person under one of two theories of liability. The first theory is often referred to as the one bite rule. If the owner of the dog that inflicted the injury knew or had reason to know that the dog had dangerous propensities, then the owner faces practically certain liability. The idea behind this rule is that if the dog had bitten a person before, the owner will be responsible if the dog bites again. This theory of liability is also referred to as strict liability. The second theory of liability is negligence. 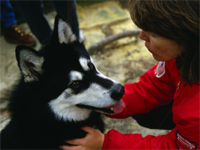 Under that theory, even if the dog had not bitten a person in the past, the owner will be liable if the owner fails to exercise effective control of the dog in a situation where it would reasonably be expected that an injury could occur. There are various local laws and ordinances that regulate the conduct of animal owners in general and dog owners in particular. For example, many counties in Maryland have laws that require the owner of the dog to have the dog on a leash and under proper control when the dog is off the owner's private property. The dog bite victim, however, will probably be unable to recover for injuries if the incident occurred on the dog owner’s property and the victim was trespassing on the dog owner’s property. In Maryland, the determination of liability has nothing to do with the breed of dog, with one notable exception. A person who is injured in an attack by a dog has the right to recover against the owner simply by establishing that the dog is a pit bull or a cross-bred pit bull. There are certain things that a dog bite victim should do when an injury occurs. Of course, the first thing to do is to seek immediate medical attention for the injuries. A dog’s mouth can contain significant amounts of bacteria and if the bite is not promptly treated, there is a risk of dangerous infection. It is also important that you try to isolate the dog that inflicted the injury and figure out how to locate the dog’s owner. Report the bite as soon as possible to preserve evidence of the injury and also document the injuries with photos. If you are contacted by an insurance company regarding the dog bite injury, it is important that you do not speak to the insurance company until you have secured the advice of an experienced attorney. Insurance companies are very skillful at asking questions in a way that will allow them to protect their interests and to defeat your claim. The personal injury lawyers at Lebowitz & Mzhen Personal Injury Lawyers, have successfully represented individuals who have sustained neurological injuries, permanent scarring, and other serious injuries from being bitten or attacked by a dog. If you have been injured or attacked by a dog in Maryland, Washington D.C., or the surrounding areas, or if you know someone who has been bitten by a dog, please contact Jack Lebowitz or Vadim Mzhen to set up your FREE, no obligation consult. You can reach us via e-mail or by calling our toll-free number at (800) 654-1949.